Aristotle described beetles as “insects with wing cases” = Coleoptera, from Greek koleon, “sheath”, and pteron, “wing.” There are about 450,000 species of beetles, representing about 40% of all known insects. 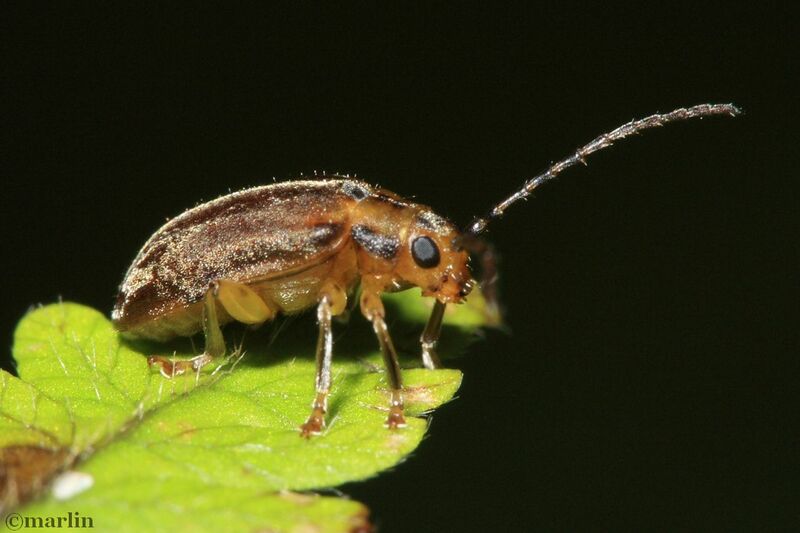 Beetles live in nearly every habitat, and for every kind of food, there’s probably a beetle species that eats it. Beetles first appeared during the lower Permian period, about 270 million years ago. Along with butterflies, bees, flies, moths and some other invertebrates, beetles have the most complex form of metamorphosis, called complete metamorphosis, or holometabolous development, which includes four distinct phases: egg, larva, pupa, and adult. Eggs develop in the female beetle’s ovaries, and are laid in a protected place with conditions suitable for the development of the larvae, including a ready food supply. Eggs are laid singly or in masses; hatching occurs within several days. The young are left to care for themselves. 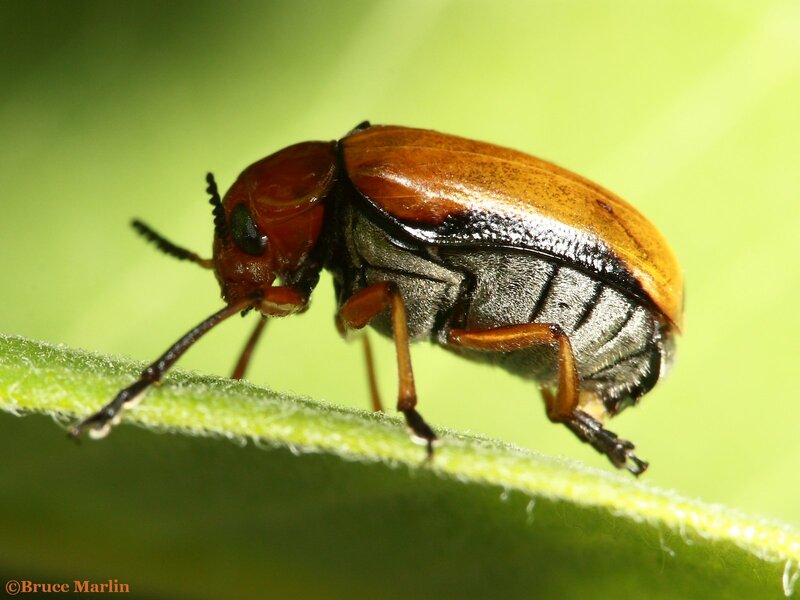 June 5, 2015: Chicago Botanic Garden officials reported the viburnum leaf beetle (above) has been spotted at the 385-acre facility at Glencoe, Illinois, for the first time in its 43-year history. Hundreds of leaf-munching larvae were discovered at two locations in the park, demonstrating this destructive pest’s spread westward. Read more. Longhorn Beetles – Family Cerambycidae contains beetles with extremely long antennae, hence the common name. There are over 20,000 known species. Many longhorns are serious agricultural pests, as their larvae have the unfortunate habit of boring in wood, e.g. The Asian longhorn beetle which has been responsible for the (preventive and) resultant destruction of thousands of trees in Northern Illinois and other locations in the United States, Canada, and around the world. Most Cerambycidae larvae feed within dead, dying or even decaying wood, but some taxa are able to use living plant tissue. The larvae of a few species move freely through the soil, feeding externally upon roots or tunneling up under the root crown. 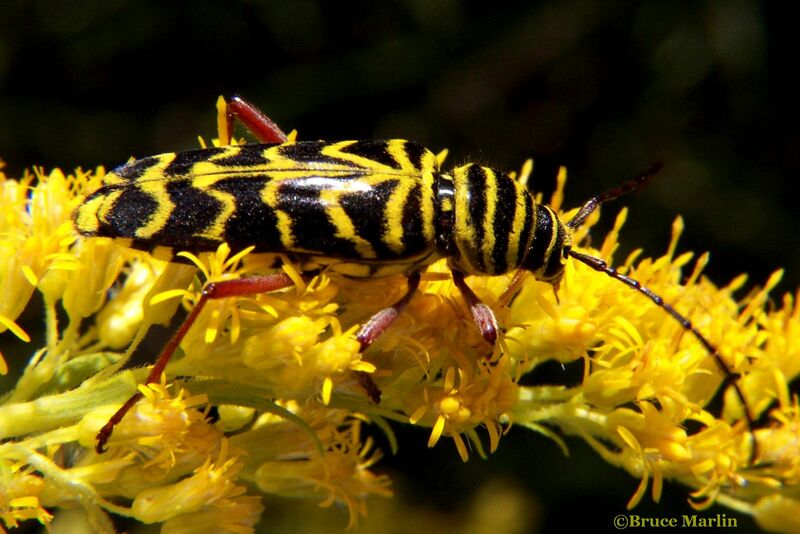 Most adult cerambycids, particularly the brightly colored ones, feed on flowers and pollen and as such can be important pollinators of some flowering plants. Other species consume sap, leaves, blossoms, fruit, bark or fungi. Leaf Beetles – Family Chrysomelidae is 2nd largest among the phytophagous (plant-eating) beetles, taking a back seat only to the weevils (Family Curculionidae). There are as many as 35,000 described species and perhaps up to 60,000 total species. Presently, the Chrysomelidae are classified in 195 genera and approximately 1,720 valid species and subspecies (plus 149 Bruchinae species) accepted as occurring in North America north of Mexico. Leaf beetles feed strictly on plant materials. The adults usually consume leaves, stems, flowers, and pollen. Most larvae are subterranean in habit, feeding on roots and rootlets, but others will consume foliage as well. Many chrysomelids are very specific to particular host plants, but most are able to live on a variety of plants, e.g. the so-called dogbane leaf beetle, Chrysochus auratus, which feeds on prairie plants such as milkweed (Asclepias sp.) and plants in the dogbane genus Apocynum. 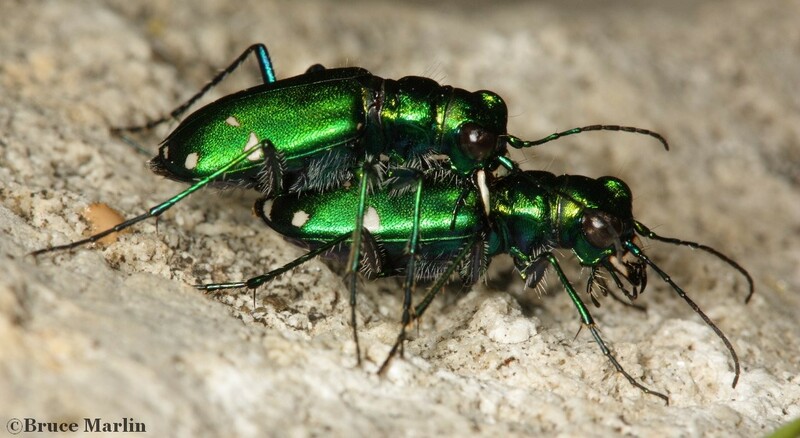 Ground Beetles & Tiger Beetles – Family Carabidae is one of the largest insect families with over 30,000 species worldwide. Most are shiny black, but some are brightly colored. They have a conspicuous prothorax (the wide area in front of the narrow “waist” and immediately behind the head) and long legs with spurs on the tibia. Tiger Beetles, being a subfamily of Carabidae are naturally quite similar morphologically. The ground beetles differ in the following ways: antennae inserted above the mandibles to the side of the clypeus, and below the eyes. Family Cantharidae – Soldier Beetles are soft-bodied, often brightly colored insects almost always found gathered on flowering plants. They are slow, lumbering fliers and easily caught; not surprisingly, they have chemical defenses which make up for these apparent evolutionary shortcomings. 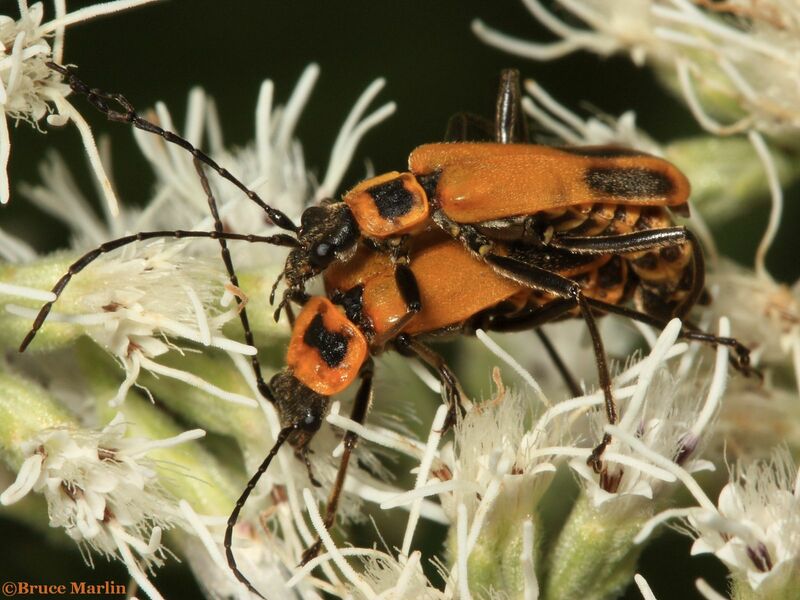 Soldier beetles produce cantharidin, a poisonous irritant produced in paired glands in the prothorax and on each of their first eight abdominal segments. When molested, the beetle emits droplets of toxic, irritating white viscous fluid from pores along their sides. 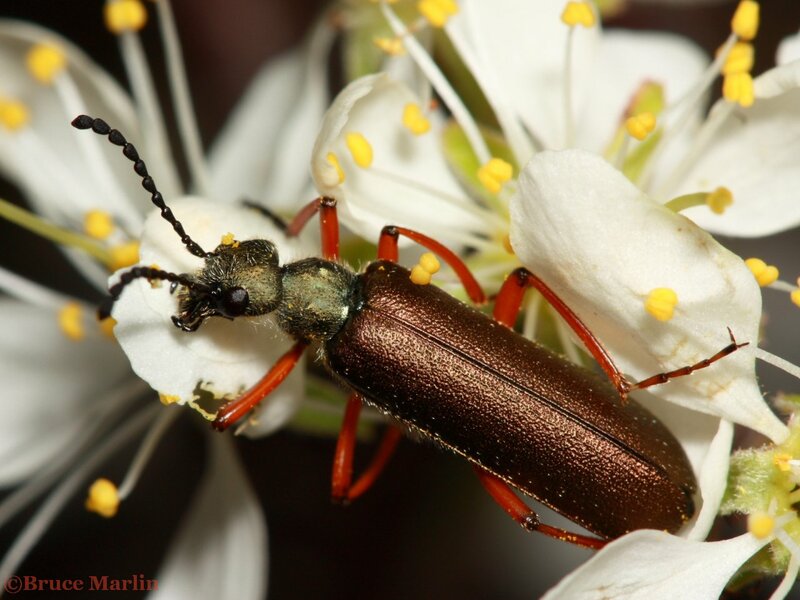 Family Meloidae – Blister Beetles also produce cantharidin, just like their brethren the soldier beetles. Stored in the insect’s blood, the compound is stable and remains toxic even in carcasses. Animals may be poisoned by ingesting beetles while grazing or eating harvested silage. Absorbed through the intestine, this blistering agent can cause symptoms such as inflammation, colic, straining, elevated temperature, depression, increased heart rate and respiration, dehydration, sweating, and diarrhea. Cantharidin can also cause severe skin inflammation and blisters. 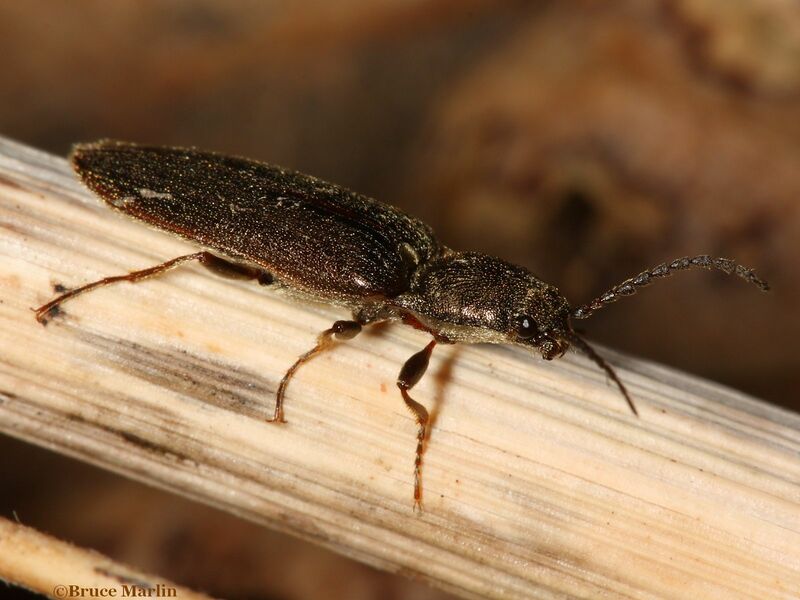 Click Beetles – Family Elateridae are commonly called click beetles, elaters, skipjack, snapping, or spring beetles. They posess a mechanism by which they can violently launch temselves several inches into the air, a method they use to avoid predators and right themselves if they happen to fall on their backs. A spine on the prosternum can be snapped into a corresponding notch on the mesosternum, producing a violent “click” which can bounce the beetle into the air. There are about 7000 known species. Scarab Beetles – Family Scarabaeidae The ancient Egyptians worshipped a scarab beetle Scarabaeus sacer as the incarnation of their sun god, Ra. The species’ habit of rolling a dung ball for use as a larval food was analogous to the sun being rolled across the sky. The scarab beetles’ distinctive antennae are tipped with leaflike plates called lamellae, that can be drawn into a compact ball, or fanned out when sensing pheromones or aromas. The front tibia are evolved for digging. Many scarabs are scavengers that help recycle dung, carrion, and decaying plants. 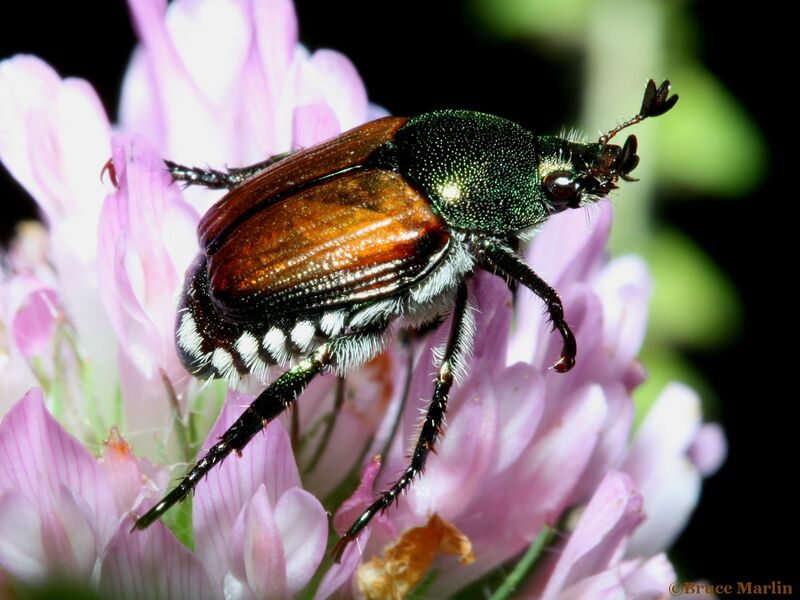 Others are agricultural pests (e.g., the Japanese beetle). The scarab family has about 1300 North American species. Weevils – Family Curculionidae Also known as snout beetles, are among the most destructive insects on the planet. The Boll Weevil is one of the most famous of all insects, devastating the U.S. cotton crop in the 1920’s, and still causing upwards of $300 million in damage each year. 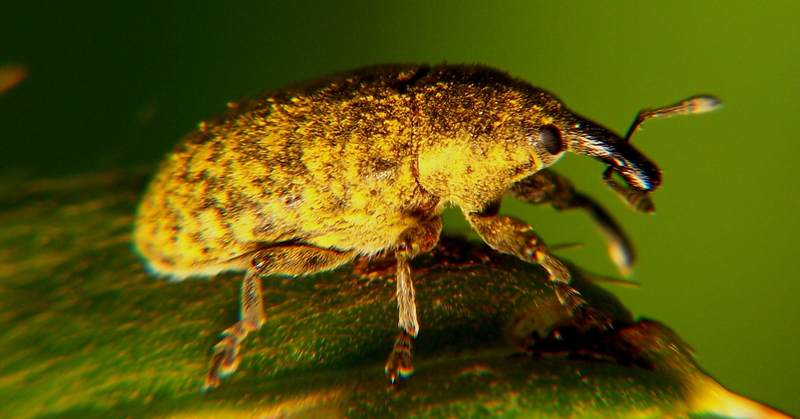 There are over 35,000 species of weevil, with more than 2,500 species in the United States and Canada alone. All are strictly herbivorous. The mouthparts of snout beetles are modified into down-curved snouts, or beaks, adapted for boring into plants; the jaws are at the end of the snout. The bent antennae usually project from the middle of the snout.